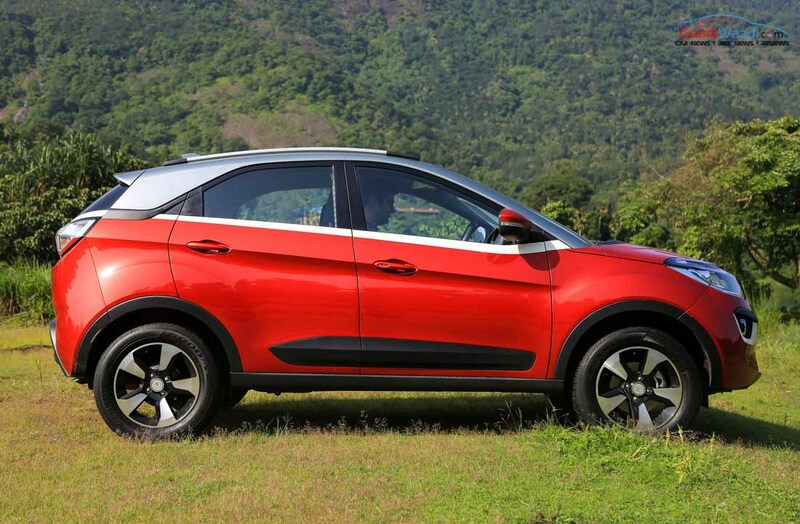 First showcased at the 2014 Auto Expo as a concept before debuting in pre-production form at the following edition of the motoring show, Tata Nexon is all set to launch in September just few months before the 2018 expo. 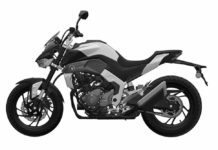 It shows that the brand took four years to transform the complete concept into a road-going model in appreciable manner. 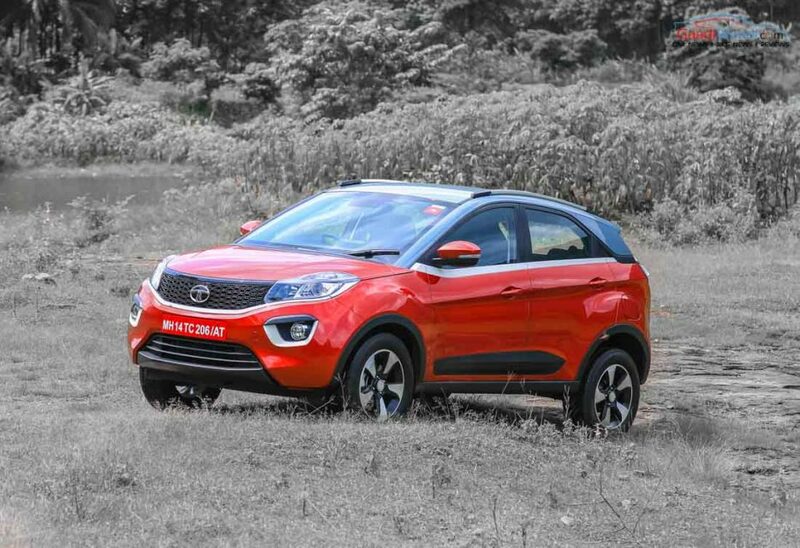 As the competition in the compact SUV segment is sky high, Tata needed a visually pleasing as well as a capable SUV to compete in compact space and the Nexon is the apt answer. 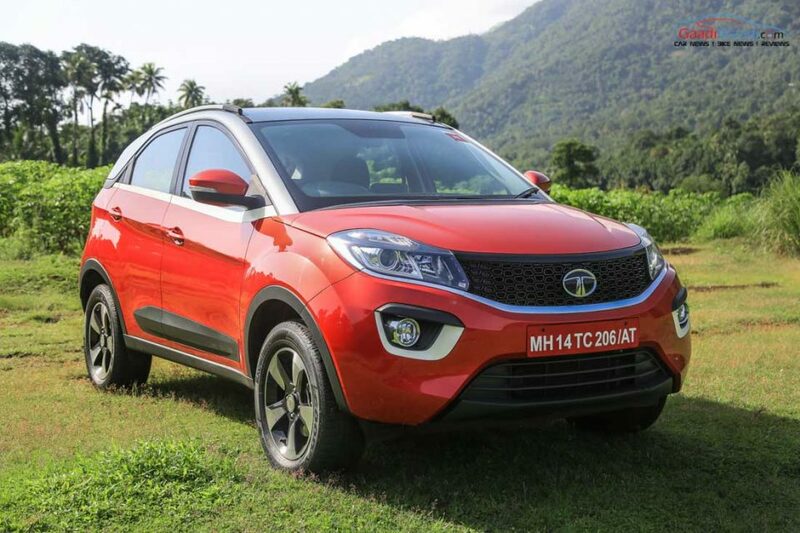 Tata says the Nexon took its design inspiration from Range Rover Evoque and we cannot certainly argue against it. Following the impressive Hexa that took the brand’s status a few notches up, the JLR expertise is rightfully flowing into the veins of the volume segment courtesy of the Nexon. 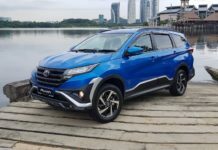 It is the most charming compact SUV in its segment and you would appreciate the time spent in bringing the concept to light. The envying fact is that there are very little changes to the concept we saw at the Delhi Auto Expo. It sticks by the Tata’s Impact design philosophy with a swoopy profile and flowing character lines all around. Upfront, the big projector headlamps are neatly aligned with the turn indicators sitting atop, dividing the housing with a horizontal strip. 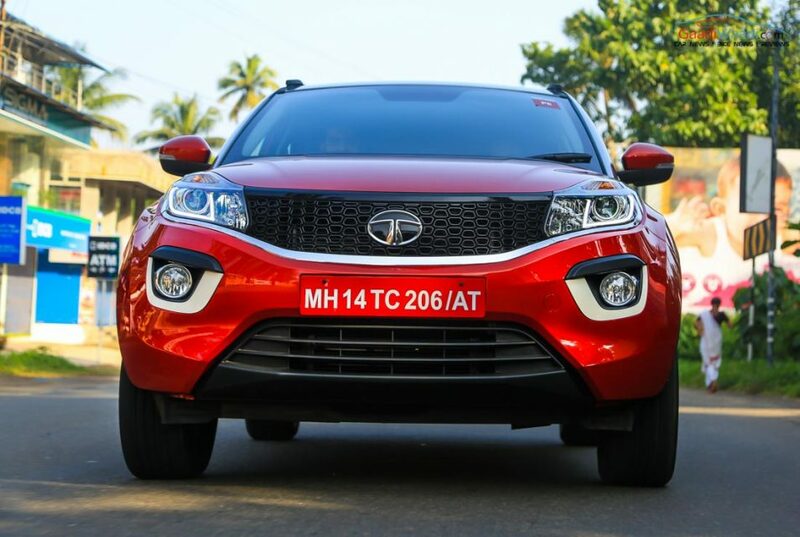 The presence of LED lights make it all attractive while the meshed front grille travelling towards the ends gets inspired from other Tata cars. 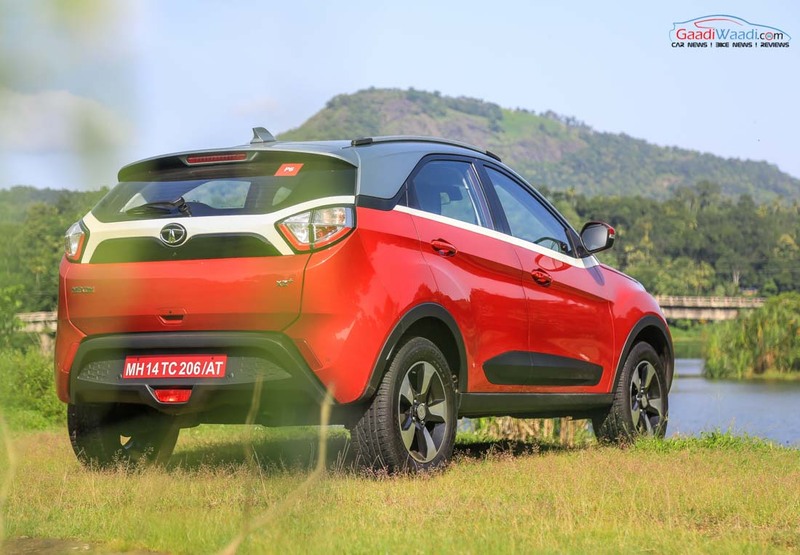 The lower air intake is large and adds SUV character to the Nexon while on each side, the eyebrow shaped fog lamp with white ceramic shaded bezel makes the front fascia attractive. Moving on the side, first thing you will notice is the dual-tone exterior as it is the order of the day. Every manufacturer has jumped in the bandwagon to offer that but it has been there with Nexon since its concept stage and thanks to Tata for not messing it around. The coupe inspired grey floating-roof is definitely an eye-catcher as it travels to the quarter panel via c-pillar. The roof rails are essential functional element and they are shaped elegantly to fall into the rear end without hurting the coupe-ish silhouette of the Nexon. Tata uses white ceramic strip for raising belt line which travels to the rear from under the c-pillar and the distinctive side profile comprises of a slightly angled line running through the door handles. The black cladding and black strip running from the front wheel arch to the rear add further to the SUV credentials. The Nexon does ride on credible 215/60 section 16-inch tyres and it elevates the rugged feel of the already functional-looking SUV. The rear profile is another quirky factor that makes the Nexon drop dead gorgeous. The LED tail lamp is nothing short of clinical and glows to good use. 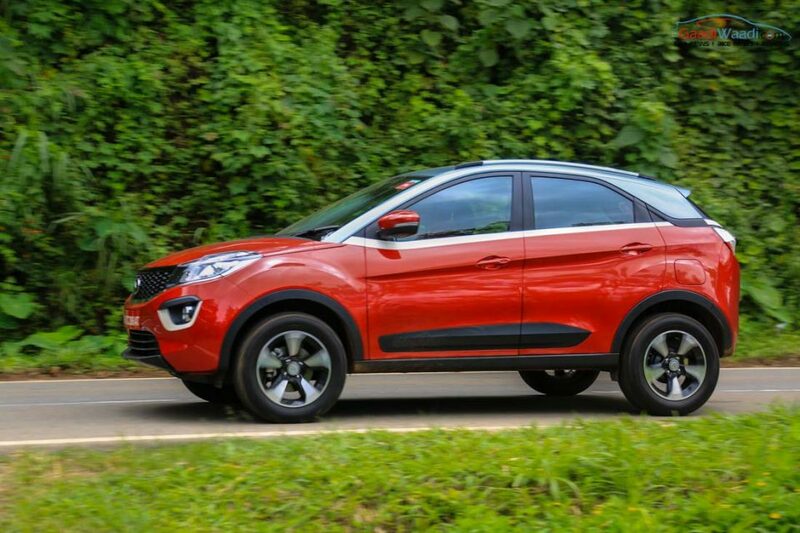 It is easy to say the Nexon has a two-tone exterior but the finer design details that make this SUV standout will let you notice that the slingshot line with X graphics bringing a triple-tone feel to the rear. The dual-tone rear bumper is a mixture of body colour and the black guarding element as a separate unit. It presents a modern and sporty feel to the SUV. 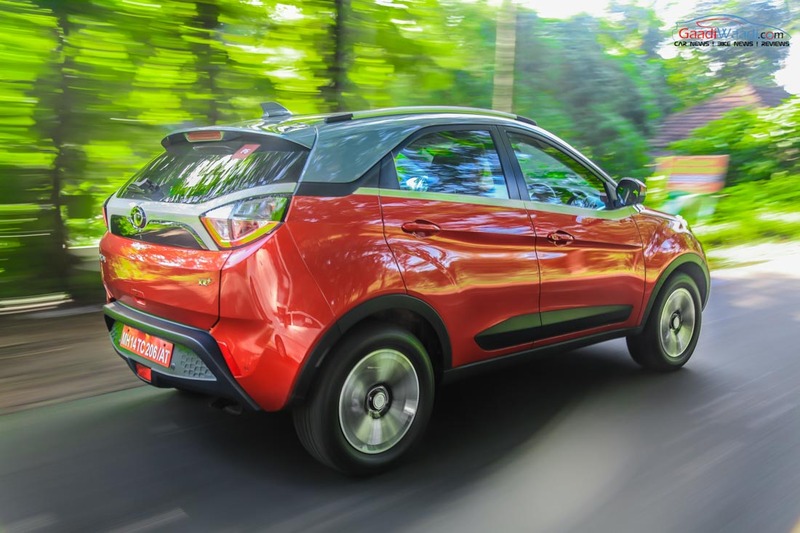 Tata Nexon is measures 3,994 mm in length, 1,811 mm in width and 1,607 mm in height. It gains a wheelbase of 2,498 mm and has fuel tank capacity of 44 litres. The bootspace of 350 litres can be extended to 690 litres when rear seats fold down flat and there is impressive ground clearance of 209 mm. So overall, Tata left no stone unturned while creating the Nexon a good looking car which is in our opinion is the one of the best in the segment. The Nexon is the first Tata vehicle to feature a push button start and it’s an added convenience you would not want to miss. Interior and features package is the USP of this SUV on a nutshell. 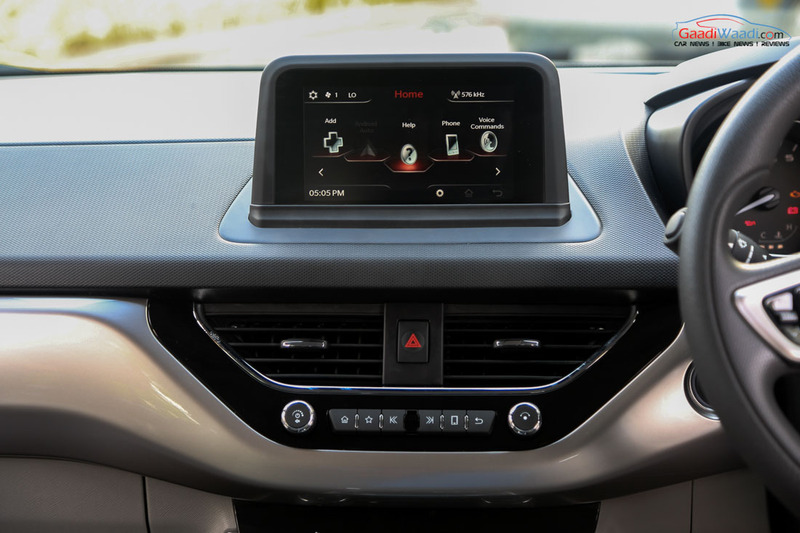 For instance, the 6.5 inch HD screen pops out of the dash top and combined with the ConnectNext App suite and bult-in Android Auto, Bluetooth and USB connectivity you could do a whole bunch of things on-the-go. Apple CarPlay will be included in quite a while said Tata. 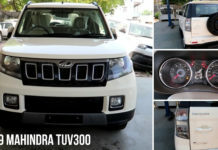 The chunky steering fits nicely inside the driver’s cockpit and the instrument cluster is something we have already seen in the latest generation Tata vehicles. There are several features you would be treated to like the reversing camera with guide lines, a different approach to the cooled and deep glove box, front and rear armrest, and the fabulous Harman eight speaker audio system with voice control and command recognition. 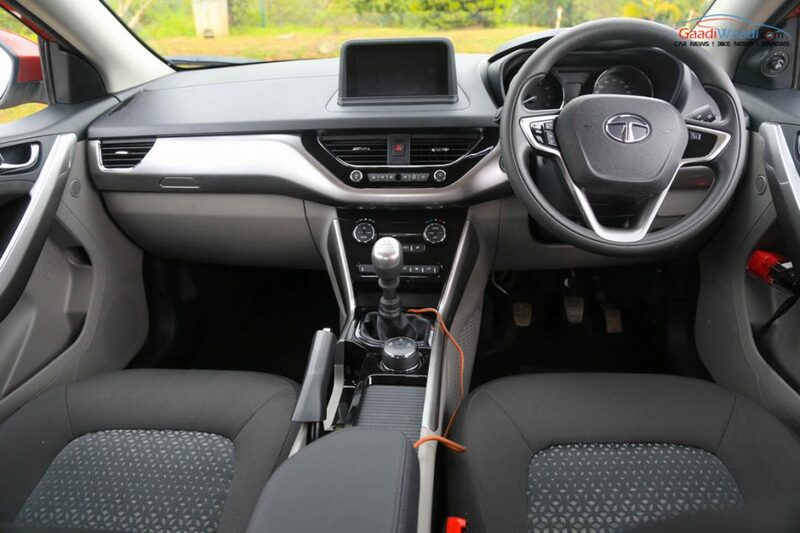 The touchscreen’s interface is a huge improvement over the Tigor and Tiago. In the middle, what Tata calls as the “Grand Central Console” is inspired from upmarket cars boasting a sliding tambour door mechanism for easy storage and this gives a premium feel to the car. The console has a rotary knob that activates different driving modes Eco, City and Sport and is a first-in- segment feature. There are 31 different utility spaces inside the cabin. 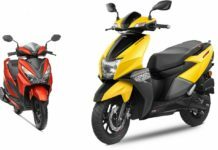 While most manufacturers claim about the number of storages, you would only end up with finding just a few useful but in Nexon’s case there are plenty of them adhering to your needs like the bottle holders in all four doors and the umbrella holder. Another impressive feature is the Wrist Band key. 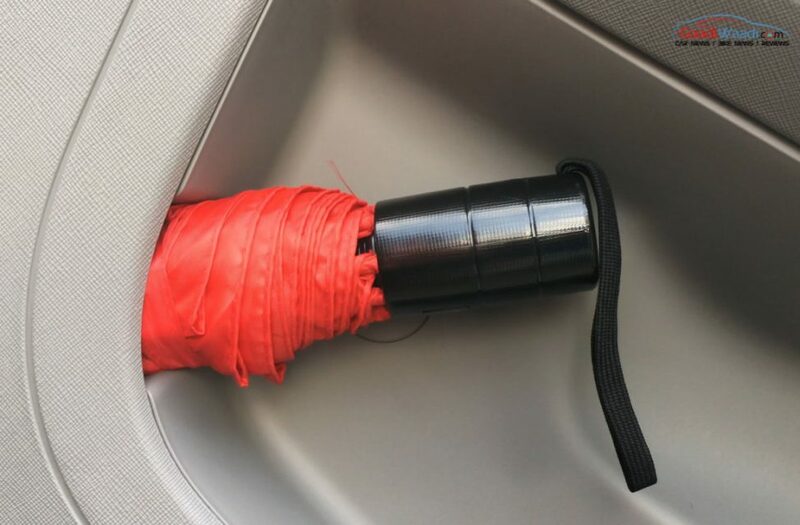 Because of it, you don’t need to carry the car’s key all the time. It will be a handy feature when you out for jogging, running or swimming. Also you can stick your umbrella out in wet climatic conditions courtesy of the umbrella holders in the both front doors. When running out of charge during long journeys, the 12V front and rear sockets come really handy. Voice alert for front door and rear door open to engage parking brake and change drive mode is another convenience factor you would grow to love. Little stuff like these makes the Nexon quite conventional. The rear Ac vents comes with the Air flow control and not every car in the segment comes with this feature. On the safety front, the Nexon has driver airbag, ABS and EBD as standard from the base variants. 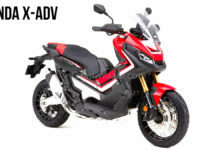 215/60 R16 Tyres provides excellent road grip and adds confidence while cornering at high speed. 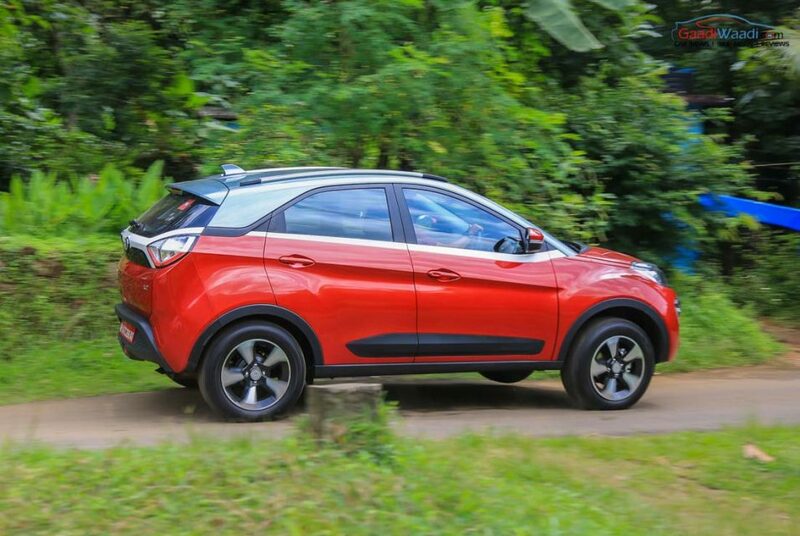 Overall, the Tata Nexon is a feature-rich car with superior built quality and the long feature list is going to be the USP factor obviously. You should have been curious to know about the engine as much as us wanting to drive it? 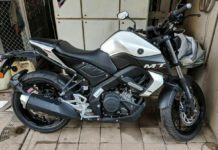 There is an all-new turbocharged 1.2- litre, Revotron, three-cylinder petrol engine and a 1.5-litre, Revotorq, four-cylinder diesel doing duties. Both engines are mated to 6-speed MT and will get AMT option later this fiscal. We drove the Petrol variant first. It is the same 1.2-litre petrol from Tiago but the added turbocharger made a big difference. 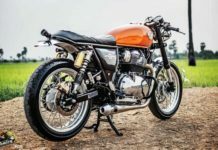 This unit generates 26 PS over the standard engine at 110 PS and 170 Nm of torque, however, you will feel the big difference only around 2,300-2,500 rpm once the turbo kicks in. 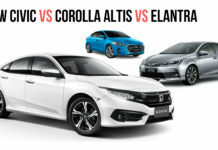 The engine feels the same as Tiago for initial acceleration and is powerless in first gear. Climbing up from standstill needed a proper effort of handbrake and clutch. But once the accelerator is pushed hard and the needle crosses 2,300 rpm, this engine starts showing the real fun of the extra 26 PS on road. Move the drive mode to Sport, it brings a wow feeling on the face. In that mode, you can stretch the car until 40 in first, 80 in 2nd and 120 in 3rd easily. 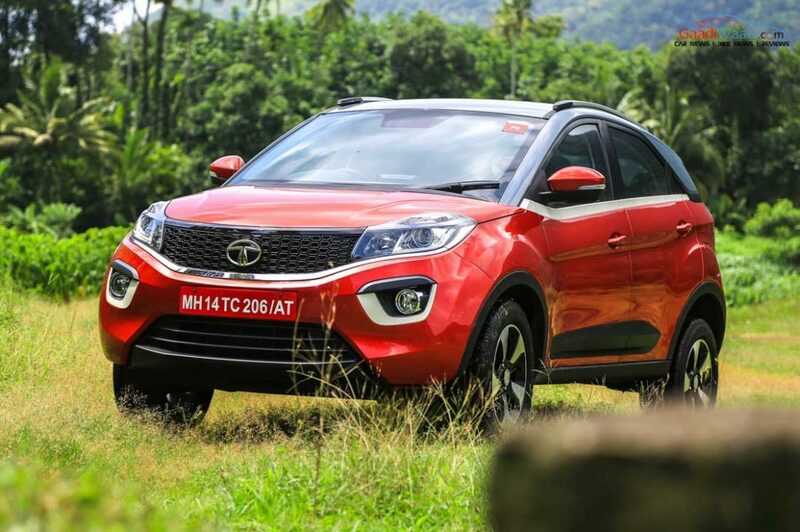 Being a three-cylinder engine, Tata has managed to cut the cabin’s noise pretty well. Along with the peppiness, this engine delivers a good mileage too – all you need to do is cruise in 6th gear for the maximum fuel economy with Eco mode on. On our drive route, we tested the SUV 30 kilometers up the hill and it needed frequent gear changes but Sport mode helps you out most of the times. By the time I reached the point from where we had to exchange the petrol version with diesel, I was quite impressed by this engine. It has enough attributes to give – Power & Good fuel economy thanks to the Eco Mode. Only after reaching there I realised that I drove the car in 6th for just 4-5 second on my 100 km drive – as it was a busy single lane road all the way. We got 10.5 kmpl of mileage besides the way I drove the car all the way in Sport mode. 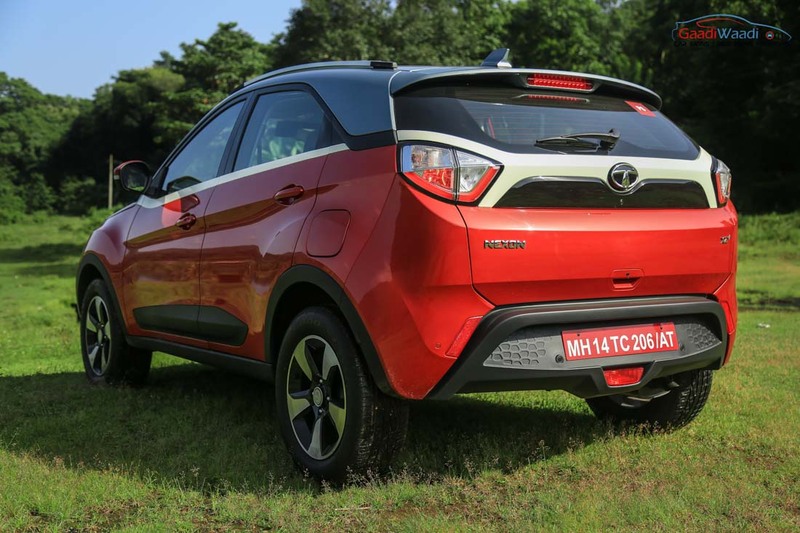 On the return, I was driving the 1.5-litre four cylinder diesel engine powered Nexon. This mill generates exactly same power as the petrol version at 110 PS but generates a massive torque of 260 Nm at 1500-2750 rpm. As the figure suggests, this is definitely a fun machine and it justified the same on remaining 100 km long drive. The power delivery is impressive in lower gears but for that, you have to remain in turbo zone to get the most out of it. 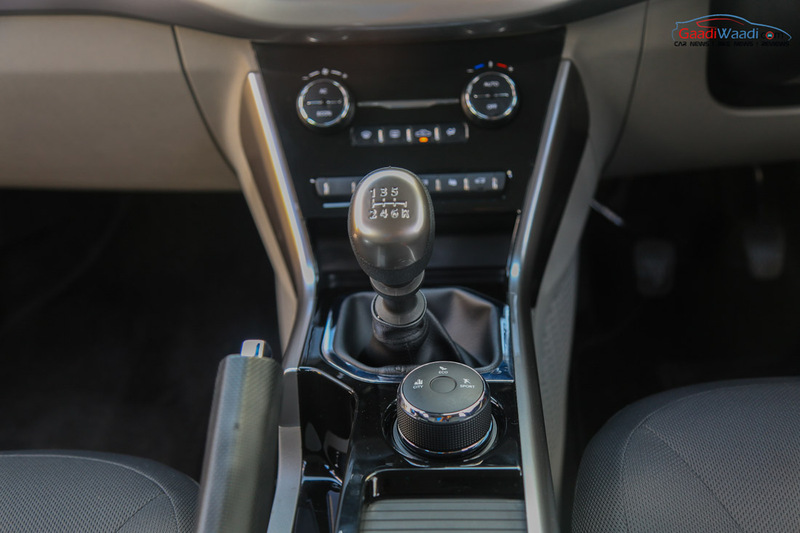 The multi drive modes is more than just a rotary dial and it does the duty very well and you will feel the big difference of performance in each mode. 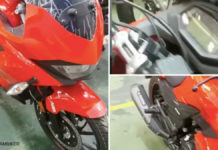 Post 3,000 rpm, engine sound turns into noise but it is of the segment standard. We got 17 kmpl of mileage on our 100 km plus drive and we are happy with that considering the fact that it was driven all the way up to 4th gear only and sometimes in 5th. 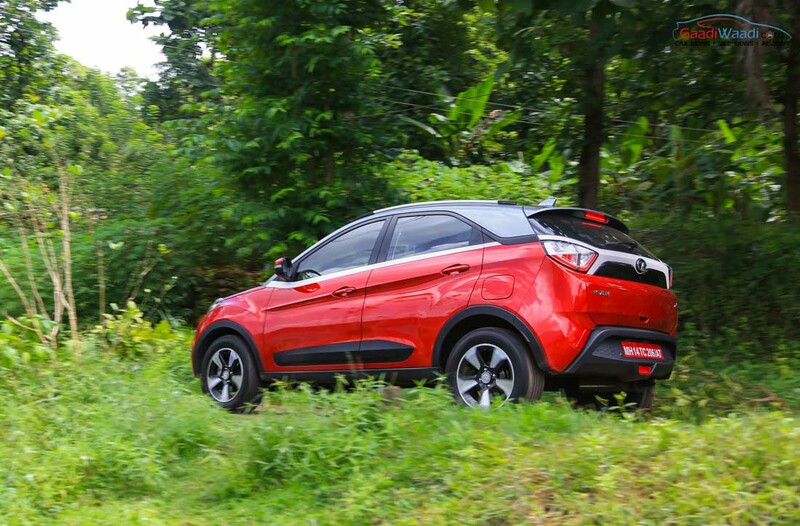 The nexon comes with 215/60 R16 tyres which is the best in segment resulting in a surprising 209 mm ground clearance with impressive approach angle and departure angle. 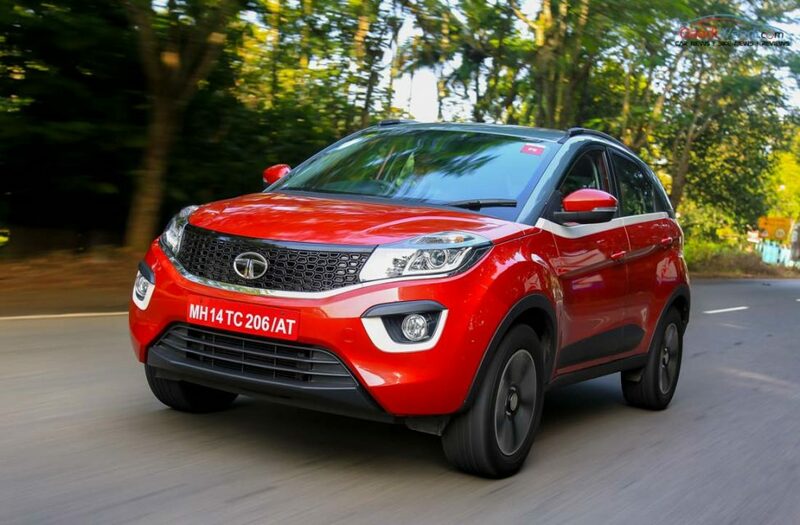 Steering is the biggest turnaround in this modern day Tata and it’s even superior than the flagship Hexa (quote us on this) in terms of the feedback. I was really impressed with the way steering behaved – it is light at low speed especially in city traffic and adds weight with speed. The steering is more posed towards the driver and you can’t adjust its travel as no telescopic option is there. It could be a bit uncomfortable for some tall drivers like me. 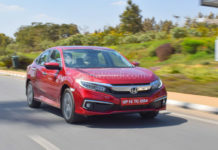 Suspension was above my expectation and the car can handle any kind of dilutions of the typical Indian roads especially rural roads that are very comfortable and you won’t feel much in the cabin. And thanks to its 209 mm ground clearance, it can comfortably do some off-roading as well with full 4 passengers on board. 4 Passengers? Why not 5? Sorry, only 4 can accommodate in the car comfortably and the 5th should be a child. 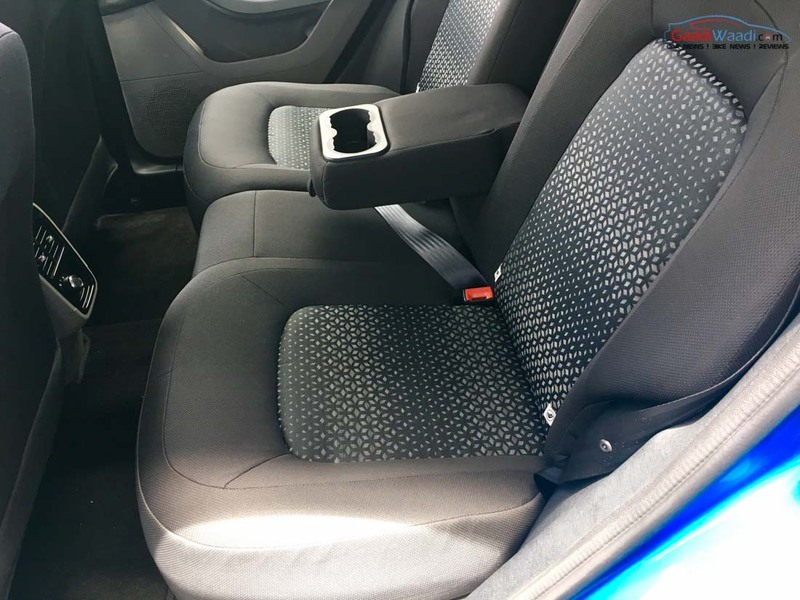 However, the car comes with twin sculpted seats at the back which results in a comfortable ride for both the rear passengers on long drives. While driving the car, you will feel the less thigh support and you can’t use side support for knee as the room is broad between the “grand centre console” as Tata calls it as and the doors. I felt that Tata should have added telescopic steering or reduced the standard length of the steering. 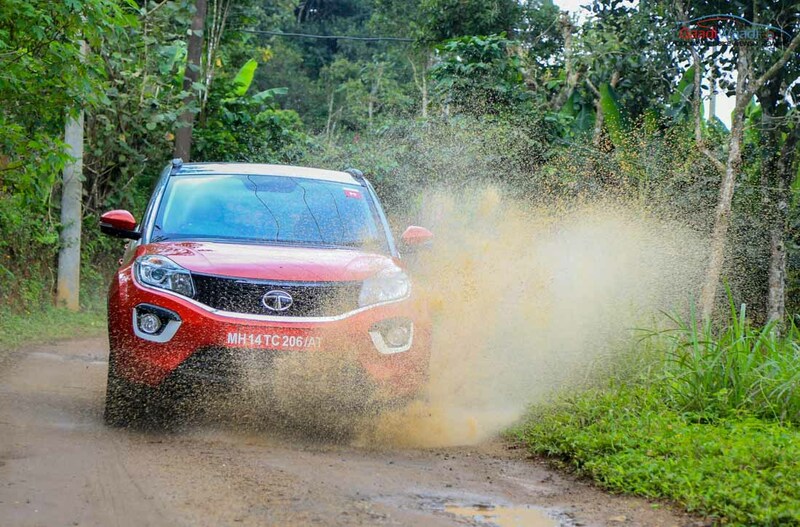 Being a compact SUV, the Nexon delivers a full-grown SUV fun on road and its body roll is superbly managed. Go fast on the corners and ready to be amazed by its cornering stability thanks to the wider tyres and good suspension setup and some to the Tigers driving the car (funnily). 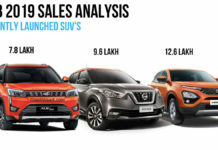 Overall, on the driving dynamics part, Nexon is way ahead of its rival and it will set a new benchmark of in the segment surely as far as we can think. The Nexon is a compact SUV with class-leading interior, impressive engine options with good fuel economy numbers, good built quality, segment-best ground clearance, suspension, steering and much more. It is one of the surprising vehicles we tested of late by a huge margin and has delivered beyond its expectations and now a strong contender of 2018 Car of the Year award. 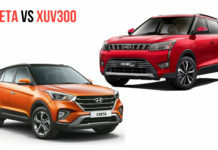 It is going to be a tough competitor for already settled rivals like Maruti Vitara Brezza and Ford EcoSport. 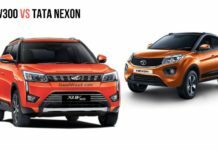 Price plays a key role here and Tata certainly did not disappoint as it has been priced in a highly competitive range at Rs. 5.85-9.45 lakh (ex-showroom). 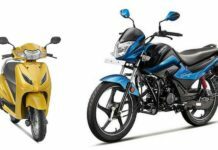 It makes the Nexon well over a lakh cheaper than its rivals. 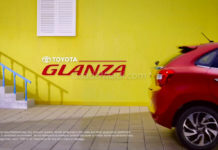 With packed features and bang-on pricing, it is a highly attractive subcompact SUV currently available in the market. However, we strongly feel that Tata should decrease the steering length from cabin or should put telescopic option at least in the top-spec variants. The upcoming monthly sales charts will be nothing short of dramatic we would reckon because of Nexon. By the way, can Tata put a AWD option in future in this supple platform? Seems unrealistic now but fingers crossed. Do Comment your view on this below!